Group B has been dubbed by many to be the “Group of Death” for Euro 2012. Boasting 3 of the top 5 ranked squads in the world with Germany, the Netherlands, and Portugal and rounded out by 22nd ranked Denmark. Top talents like Cristiano Ronaldo, Mesut Ozil, and Arjen Robben will provide exciting football to go along with the boisterous crowds they will likely attract. Many have the eventual champion of Euro 2012 coming from this group. This year Denmark celebrates the 20 year anniversary of their shocking Euro 92 victory over Germany in Sweden and will look to repeat these results in Poland/Ukraine. They will certainly have their work cut out for them, drawing into what is considered by most to be the most difficult group in the tournament. Morten Olsen is the longest tenured manager in Euro 2012, having successfully led the Danes to qualification for the 2002 and 2006 World Cups and Euro 2004. Olsen’s tactical preparation and acumen is on par with any of the tournament’s top managers, and Denmark will be ready for the stiff competition they will face. The Danes could employ either a 4-3-3 or 4-2-3-1 depending on fitness and opposition tactics. One certainty will be Nicklas Bendtner leading the attack from a central striker position. The controversial Arsenal/Sunderland man will be flanked by the Brondby tandem of Michael Krohn-Dehli and Dennis Rommedahl. Rising Ajax star Christian Eriksen will be a player to watch for the Danes, the creative 20 year old attacking midfielder has attracted a lot of attention and was named 2011 Danish Footballer of the Year. His creative influence and flair will be juxtaposed by hard tackling, industrious midfielders like Christian Poulsen, Niki Zimling, and William Kvist. 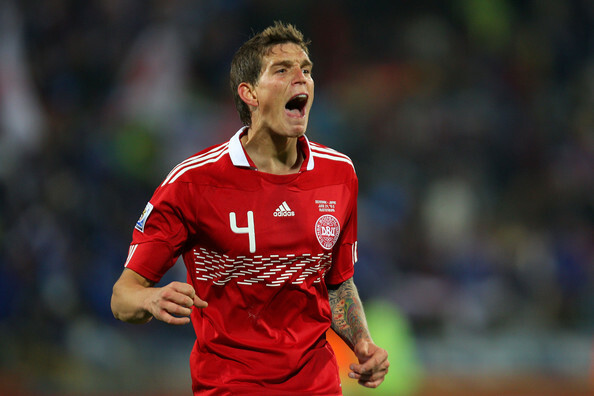 Captain Daniel Agger will anchor the Danish defense that conceded only 6 goals in their qualifying group, but who his defensive partner will be is still a question. Simon Kjaer is coming off a season where he failed to impress at Roma, while Andreas Bjelland lacks international and top club experience, creating controversy at the center back position. Simon Poulsen of AZ Alkmaar will feature at left back, offering a balance of attacking and defensive skills. Lars Jacobsen will feature at right back, lending his cultured talents to the squad. A lack of depth overall is the main flaw of the Danish squad, to go along with having no certain first choice keeper. Manchester United’s Anders Lindegaard, uncapped Kasper Schmeichel, or Evian’s Stephan Andersen could take over goalkeeping duties after Stoke’s Thomas Sorensen was left out of the final squad due to a back injury. Ultimately, this Danish squad lacks the depth and quality overall to come out on top against teams like Germany and the Netherlands. Despite being familiar with qualifying group opponents Portugal, they would still need positive results against two of the top 5 clubs in the world according to FIFA rankings. Qualification for the knockout stages looks to be a bridge too far for the Danes. The run up to Euro 2012 has not been as smooth as manager Joachim Low may have liked, but after a perfect qualifying campaign, Germany stumbled this weekend suffering a 5-3 defeat at the hands of Switzerland. Low took the opportunity to experiment in the friendly, but will likely field a more familiar squad in the opening match against Portugal. Low is a tactical genius that has introduced a new brand of football to the national team, now displaying an expansive, counter-attacking style that is hard for opposition to match. After finishing as runner-up at Euro 2008 and finishing third in the 2010 World Cup, Low and Germany have their eyes set on European glory. Germany boasts one of the deepest and most talented squads at Euro 2012 and with an average squad age of just over 24, one of the youngest. Miroslav Klose is the sole player over the age of 30, and the legendary striker needs just 5 goals to equal Gerd Muller as Germany’s all-time goal leader. Bayern Munich’s Mario Gomez will be the other attacking option at the front of Low’s 4-2-3-1 (or 4-3-3). Lukas Podolski or Thomas Muller will flank the lone striker, but depending on the circumstances Germany may appear to play a 4-2-4 with all the available attacking options at Low’s disposal. Mesut Ozil looks to follow up his La Liga title success with a Euro title to match and the midfield maestro will be joined by German phenom Bastian Schweinsteiger and Madrid teammate Sami Khedira. The midfield is one of the deepest in Europe, rounded out by emerging talents Toni Kroos, Andre Schurlle, and Lars Bender. German defense has been a revolving door throughout qualification. Lahm’s Munich teammates Jerome Boateng and Holger Badstuber could feature at right back and center back respectively, while questions still remain whether Mats Hummels or the aging and injury prone Per Mertesacker will be utilized by Low. 2011 Bundesliga Player of the Year, Manuel Neuer, will don the gloves and provide back line instruction from the goalkeeper position. 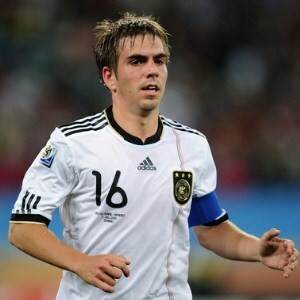 Germany comes into Euro 2012 as the second favorite team of bookmakers and pundits alike. With a surplus of talent capable of producing breathtaking football, Low’s squad is poised to make history in Poland/Ukraine. If they are able to emerge at the top of Group B, they will have to be considered favorite in the group stages. The burden of expectations of their fans and manager may be too heavy for the young squad to handle and Ze Germans will have to produce a result in their opening match against Portugal if they hope to advance. After falling to Spain in the 2010 World Cup final, the Flying Dutchmen are looking to capture the glory that escaped them in South Africa two years ago. Manager Bert van Marwijk has revolutionized the Dutch national team from a free flowing attacking team into an efficient, tactically disciplined side that has yielded enough results to keep his many vocal critics at bay. Despite facing criticism from Dutch footballing legends like John Cruyff, van Marwijk remains committed to his style of play that has achieved results. 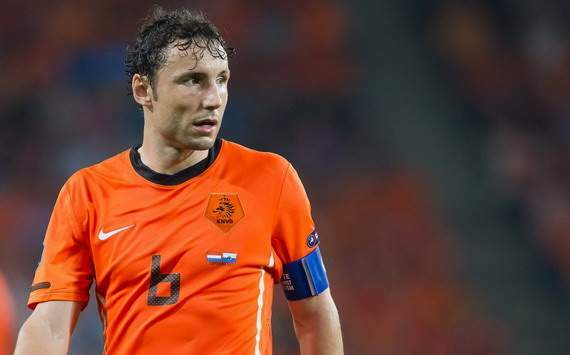 Van Marwijk’s style is exemplified by his captain Milan midfielder, Mark van Bommel. 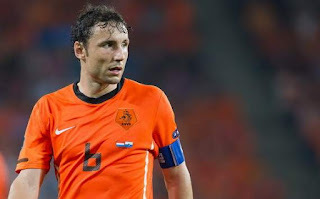 Van Bommel’s hard tackling, physical style is a factor that opposing squads must contend with. Together with his defensive midfield partner, Nigel de Jong the duo forms hard tackling, ball-winning base 2 of their preferred 4-2-3-1 formation that allows the Dutch attack to flourish. At times van Marwijk opts to deploy deep lying playmaker Rafael van der Vaart in place of de Jong, which offers the squad tactical versatility and creative genius to unleash the surplus of attacking options at his disposal. The Dutch boast attacking options that make them hard for any team to compete with. Wesley Sneijder has undergone a transformation under van Marwijk, moving from the left side of the formation to a trequartista role behind the striker in the center of the attack. Sneijder offers ambidexterity, top notch playmaking skills, and free kick expertise that have made him a Champions League winner. Arjen Robben will look to recover from his Champions League Final gaffes on the right side of the attack. Robben is a force to be reckoned with cutting in from the right side and unleashing ferocious shots with his notorious left foot. Van Marwijk’s toughest decision will be who to employ at the striker position. Klaas-Jan Huntelaar led the Dutch qualifying campaign with 12 goals, but Arsenal’s Robin Van Persie is enjoying the form of his life at the moment after winning the English Premier League Golden Boot with 30 goals. Dirk Kuyt rounds out the main Dutch striking options, offering his unparalleled workrate and leadership. The one flaw of the Dutch squad is their defensive third. John Heitinga and Joris Mathijsen are the first choice center backs, but could be exploited by attackers with pace. Wilfred Bouma and Gregory Van der Weil will feature at left and right back respectively while the tournament’s youngest player, Jetro Willems could make appearances in place of Bouma. What questions remain in the defensive line are buoyed by three top rate goalkeepers. Maarten Stekelenburg will be the first choice, but his backups are two emerging Premier League stars Michel Vorm and Tim Krul. The Netherlands will begin their tournament with Denmark and should be able to produce a result there, but their final match against Portugal will be crucial in determining whether the Dutchmen advance to the knockout stages. The Netherlands are equally capable of producing beautiful attacking football along with brutal hard tackling “anti-football”, making them one of the tournament favorites along with Group B member Germany. Cristiano Ronaldo is the man that will garner full attention from fans, opposing managers, and players throughout Portugal’s Euro 2012 campaign. If Os Navegadores are going to navigate their way through the troubled waters of Group B, it will be because of tremendous contributions from their captain, Ronaldo. The high profile Real Madrid attacking midfielder will have the eyes of the entire world on him throughout the tournament and it will be up to him to perform where he has fallen short in the past. qualify through the playoff against Bosnia & Herzegovina. Bento also led the squad to a 4-0 win over reigning World Cup and Euro 2010 champions Spain in November of 2011. Bento also ousted long time Portugal squad members Jose Bosingwa and Ricardo Carvalho, vowing the duo would never again feature for Portugal. Bento’s side boasts tactical versatility that few squads can match, capable of using 4 different formations, (4-3-3, 4-2-3-1, 4-1-2-3, and 4-3-1-2) using Cristiano Ronaldo and Nani in various roles to make up for a lack of a top talent at striker. Bento’s midfield usually consists of a player or two in a deep enforcer role, with Raul Meireles or Miguel Veloso capable of fulfilling such a role. Joao Moutinho can be deployed in a playmaking role providing service to the talented attackers Nani and Ronaldo. The role of striker will be a question mark for Portugal, with Helder Postiga, Hugo Almeida, or 20 year old Nelson Oliveira all fighting for the opportunity to become the first choice striker. Bruno Alves and Pepe will anchor the Portuguese defense at the center back positions, while Pepe’s Real Madrid teammate Fabio Coentrao will play alongside them at left back. The Valencia tandem of Ricardo Costa and Joao Pereira will take over right back duties, depending on Bento’s selection. The remainder of the Portuguese defensive selection is made up of Porto defenders Rolando and uncapped 25 year old Miguel Lopes. Portugal boasts depth in the center of midfield and two of the best wingers in the tournament with Nani and Ronaldo, but their lack of a true top choice striker could impede the team. If Nelson Oliveira emerges as a first rate striker in the tournament, Portugal could emerge from Group B, especially if they get a result in either of the matches against Germany or the Netherlands. With all of the hype surrounding the Germans, I see them as the one tournament favorite that will fail to impress. With eight players still with the devastating loss in the Champions League final still weighing heavy on their conscience, a young squad, and the burden of a nation of desperate for a trophy, I view them as poised for collapse. If they are unable to produce results in their first two matches against Portugal and the Netherlands, they may already be eliminated before facing Denmark. I see the Netherlands coming out on top of the group with Portugal finishing in second. Tomorrow we’ll have a preview of the Group of Debt, Group C.